Emotional, passionate and a musical genius are just a few words used to describe Wanees Zarour. 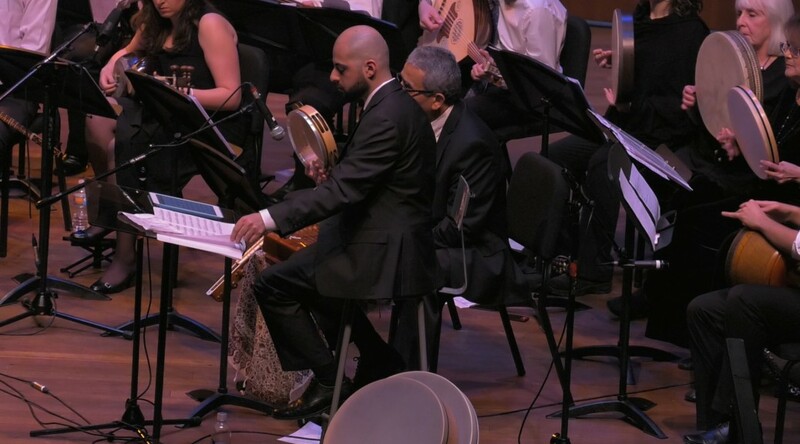 Born and raised in Ramallah, Palestine, director and composer Zarour leads the Middle East Music Ensemble at the University of Chicago, which was established in 1997. His “Persian Concert” at the Reva and David Logan Center for the Arts drew a packed house with over a dozen people sitting on the floor and a handful standing in the doorway to observe the Feb. 27 performance. This was the second of three Persian concerts. The third will be held in the summer. Zarour’s journey as a musician began at seven, when he learned to play the violin in Ramallah. He moved to the United States when he was 16. Today, Zarour primarily embeds Middle Eastern music traditions, including Arab, Turkish and Persian throughout his music. His musical expertise is evident in the way he transcribes complex pieces, including those that lack notation. The 45-piece ensemble includes a wide range of Middle Eastern instruments, including the oud, tar, santour, sitar, setar and qanun. The ensemble is composed of community members and students, whom Wanees has been directing in the ensemble for six years.